A friend of mine makes pumpkin rolls that are, according to my husband, “divine”. So I modified the recipe. They turned out fabulous! On a side note, I always thought this would be terribly difficult before and was afraid to try it but it was surprisingly simple. 1. Beat egg whites until stiff, set aside. Beat egg yolks until frothy, add remaining ingredients to egg yolks and beat well. Fold batter into beaten egg whites. 2. Spread on a 15x9x1 in pan that has been greased, lined with wax paper and greased again. If desired, sprinkle with chopped nuts. 3. Bake in a 375° oven for 15 minutes, till starting to brown on top and a little brown around the edges. 4. Turn hot cake onto a tea towel that has been sprinkled with flour and cinnamon. Peel off wax paper and trim the edges of the cake off. 5. Pull, rolling the towel up with the cake. Chill in the refrigerator for 15 minutes while you prepare the filling. 6. Unroll the cake. Spread filling evenly over the surface. Roll the cake back up and sprinkle with more cinnamon, if desired. 1. We found that the cake tastes better the second day so make it ahead of time. 2. String works fabulously to cut this cake, just cut a piece big enough to go all the way around the cake, slip it underneath to desired width, cross the string above the cake and pull. 3. It cuts better if it has been chilled. 4. The recipe says it freezes well, but mine has never lasted long enough to find out! 5. One can of pumpkin can make 4 rolls with some pumpkin left over. My friend will often substitute a baked sweet potato for pumpkin. When I was making pumpkin soup a few days ago, the baby asked for cookies. 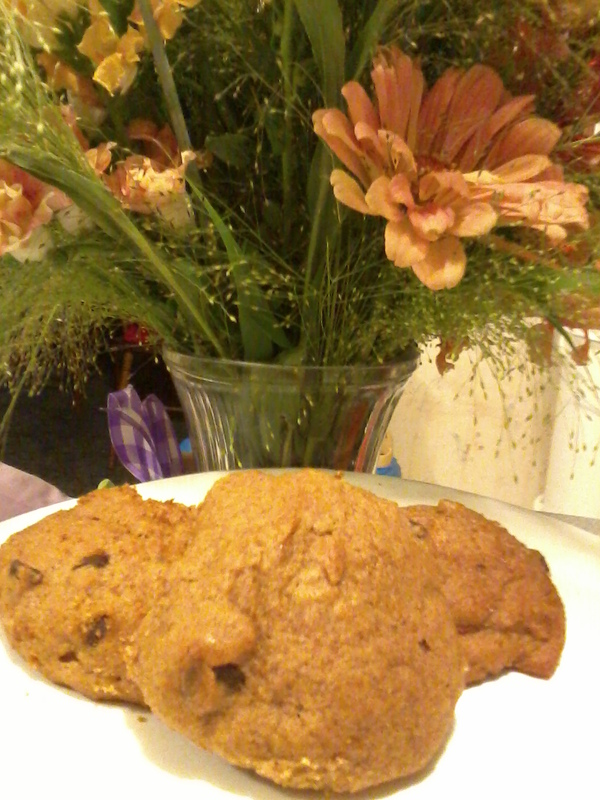 Since there was some leftover pumpkin, I thought “how about pumpkin cookies?” So I looked up a recipe on allrecipes.com fixed it to fit my diet and voila! These are awesome! I’ve eaten many, and they even won a seal of approval from my sweetheart. We will definitely be making these again! 1. Combine pumpkin, honey, stevia, vegetable oil, and egg. In a separate bowl, stir together flour, baking powder, ground cinnamon, and salt. Dissolve the baking soda with the milk and stir in. Add flour mixture to pumpkin mixture and mix well. 2. Add vanilla, chocolate chips and nuts. 3. Drop by spoonful on greased cookie sheet and bake at 350 degrees F (175 degrees C) for approximately 10 minutes or until lightly brown and firm.